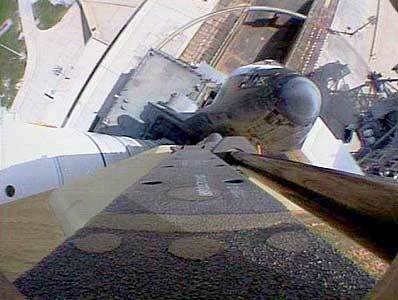 This will be the view seen live during Atlantis' launch. The camera was turned on this week for a test after the shuttle arrived at pad 39B. Liftoff is scheduled for October 2 between 2 and 6 p.m. EDT (1800-2200 GMT). The exact launch time is kept a secret until 24 hours in advance due to security reasons. The video camera is mounted to the front of the external fuel tank looking down at Atlantis. "We are very optimistic of getting pretty dramatic video going up hill," Engelauf said. NASA says the camera is to capture the public's attention, not an engineering project. "The genesis of this, quite honestly, was when the expendables community placed a few of these cameras on some of their vehicles. There was a pretty positive public reaction to the gee-wiz value of the photography. It was neat stuff to look at. "There may be some engineering value in having that kind of video but we are not doing it because we have any particular agenda from the engineering standpoint for the hardware. I think what we expect to see out of it is largely just for the cool video." Former NASA Administrator Dan Goldin was one of the camera's main advocates and the project became known in NASA circles as the "DanCam". 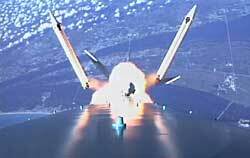 An onboard camera shows the solid rocket motors separating from a Boeing Delta 2 rocket. "It is a relatively inexpensive way to get this kind of video," Engelauf added. "It is fairly straightforward to do." 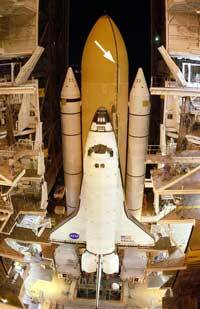 Work to fly a shuttle camera began about two years ago when external tank builder Lockheed Martin and the original maker of the cameras, Crosslink, began designing the system. Although the actual cameras for the rockets and shuttle are the same, the housings and way they are attached are different, according to officials with Ecliptic Enterprises of Pasadena, the company that now owns the camera product line.